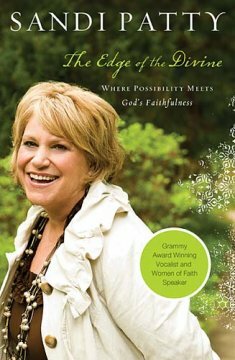 Award-winning vocalist, speaker, and author Sandi Patty uncovers the crucial decision every woman must make to leave a life of regret and find a life of freedom and joy. Every woman reaches an unavoidable crossroads where she either spirals into a life of shame and regret or walks proudly in the freedom of God's grace and goodness. In The Edge of the Divine, Sandi Patty takes readers to the heart of the crucial choice to cling to the hope God gives. Women discover that they can leave a life of wondering for a life of wonder. Wonder at the infinite love of God, at His inexhaustible mercy, and His refusal to let us wallow far from His blessings, hope, and grace. But first, as Sandi shows, women must walk to the edge of the divine and decide to jump. I must admit I have never even heard of Sandi Patty . I don't really like giving bad reviews but sometimes it is a must. Don't get me wrong it is well writen and inspiring but I felt I was reading through her personal journal of her journey and learned more about her as a person and her family. There were parts that were encouraging and she gave examples of God’s faithfulness through her various struggles. Unfortunately it wasn't interesting enough for me.